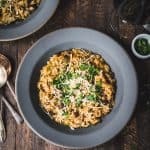 This vegan mushroom risotto is hearty and super flavorful – nobody will miss the dairy! Add onions and shallots to olive oil and butter. Sauté 5-7 minutes, or until tender and translucent, stirring often. Add minced garlic and continue to sauté for another 2-3 minutes. Add rice and stir well to coat. Let toast for a minute or two, then add wine. Stir until wine is completely absorbed, then begin ladling in broth, one ladle-full at a time. Don’t add the next ladle of broth until the previous one has been almost fully absorbed. You’ll have to stir often and keep a close eye on the risotto to prevent it from burning/drying out. When all broth is absorbed and rice is tender, stir in sautéed mushroom mixture, remaining 1 tsp salt, black pepper and vegan parmesan. Serve with more vegan parmesan and chopped parsley. Enjoy with a glass of J. Lohr Estates Los Osos Merlot! If you can’t find mushroom broth, feel free to substitute with more vegetable broth.